Posted by Amy Hardman on Oct. 1, 2015 . Part of my role working for Raw Jam & Minimum Ideas, is keeping Raw Jam’s clients up to date and in the loop. Raw Jam is a web development company and so it’s vitally important to keep clients up to date, especially as they cannot always physically see the work that is being implemented whilst it is in development. How we maintain a constant point of communication or rather, a way of managing feedback from both ends, is simple thanks to the tools that we use. In this article I’ll share my experiences keeping clients up-to-date, as well as how and what we use to do it. In short, we’ve created a series of processes that are simple and easy to repeat, time and time again and with any client. But as we have learnt more about our clients and their preferences, so our methods of administering feedback has evolved. Why is updating clients so important to us? Putting myself in their situation. I have just agreed to pay a large sum of money to create a new website, for example. I am going back and forth with design concepts and logos. Things are finally coming together and the brand is beginning to take shape, however I am not seeing the website actually materialise. Its been some time now, what’s going on? As you would expect if it were you in that situation, you would begin to ponder the same thing. As impatient humans, when we don't see immediate physical results we can become agitated and frustrated. I’ve found that even updating clients with a quick note to say that everything is on track, has made the management process that little bit easier. It not only puts their mind at rest, but it reinforces that point of communication, reassuring their concerns. After all, any communication is better than no communication at all. Here’s an example of the sort of quick update email I tend to send when we have a fairly minor update. This is typical when we are in the middle of a large piece of work. In our business, I am the middleman between the developers and the client - the translator if you will. My role is primarily concerned with relaying updates and feedback from one party to another. In fact I am often referred to as the gatekeeper of processes, because it’s my job to ensure that there is a salient, smooth and consistent level of interaction across our portfolio of clients. Admittedly, some clients are easier to update, requiring less contact. While others are more needy and demand greater attention. My suggestion here no matter what type of client, is to find every possible reason to get into contact. Update them as much as you can, so that they feel as though they are a part of a team and the decisions being made. However, this (I know) is a lot easier said than done. I’ve personally found that creating a systematic way of dealing with clients improves my organisation, helps clear my headspace and generally improvs the frequency of emails or calls I’ll make to a client. But how do you create a systematic process when each client is so different? Well, what you’re informing each client about is not necessarily as important as how you’re informing them (.e. the systems you have in place to allow you to effectively deliver consistent updates). I like to update clients every Friday on the progress of their project, some more frequently depending on their feedback and yearning to get in touch. In our line of work, having the updates written in an email is often more beneficial for both parties as it’s easier for our clients to break down, and provides a record of changes should we ever need them at a later date. We also encourage speaking live on the phone or Skype, as it often provides more clarity and establishes a well-rounded relationship. One of the biggest challenges I face, when updating clients, is translating our developers updates and notes into a format that the client (and myself) can easily understand. To help me keep sane in this regard, I use Updatey, a project management tool that we created. In actual fact, assisting with client management and updates to them more generally, was one of the many reasons why Updatey was launched in the first place. Our head developer divides workable items amongst the team, which are then distributed on Updatey in the form of tasks. Once the developers have completed specific items, I am assigned the task as a final point, but only once the items are ready to deliver to the client. Within each task, there are usually discussions mixed in with additional notes for the client. It is here that I find the basis for my updates, where I am required to translate ‘tech talk’ into something that both you and I (who aren't developers) would understand. Breaking down these chunky updates down into smaller bite size pieces of information that are easier to digest and respond to. An outline of this process can be identified in the example below. The major benefit of this system is that I am being assigned tasks as and when the developer completes the item, hence I am always equipped with a steady flow of updates ready to fire at our clients. At this point, I can either summarise the tasks in one email, and update the clients with a weekly progress report or I can send the updates more frequently, in smaller chunks. This, however, is completely down to client preference. The system above worked successfully until we encountered a client who required far more in-depth, dynamic and frequent updates. Updates that quickly became difficult to manage and track (not just for us, but for the client as well). This pain point caused us to create a new feature in Updatey which we call ’Snapshot reports’. In our mind, we thought it would be handy if instead of going back and forth with feedback, we could have a section within Updatey designed to relay information to clients in a controllable and consistent manner. 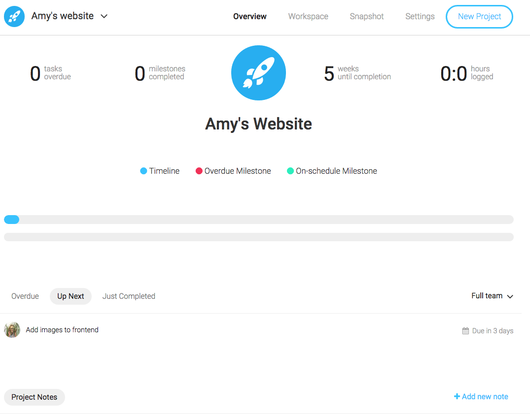 A place where they could view the status of their project including the tasks overdue, up next and completed, the amount of time remaining on the project, and the additional number of billable hours logged from creating new features. We wanted to design an area where clients could see only the parts of the daily project activity that we wanted them to see, but where they would still able to engage and leave feedback for us. We figured that if we valued this feature for handling client feedback, so might other developers, agencies and many other businesses across different industries. This became reason enough for us to create and rollout ‘snapshot reports’ as a new feature. I for one will be happy to eradicate the whirlwind of emails sent to and from clients, and between our team. Utilising this communal area, where client information can be accessed by any member of our team will be extremely helpful and dramatically reduce the lead time between each stage of a project. Our clients should also feel tuned into the progress of their project, by being able to visualise their deliverables and the overall project status. Note Below: This is an example of what the snapshot looks like. 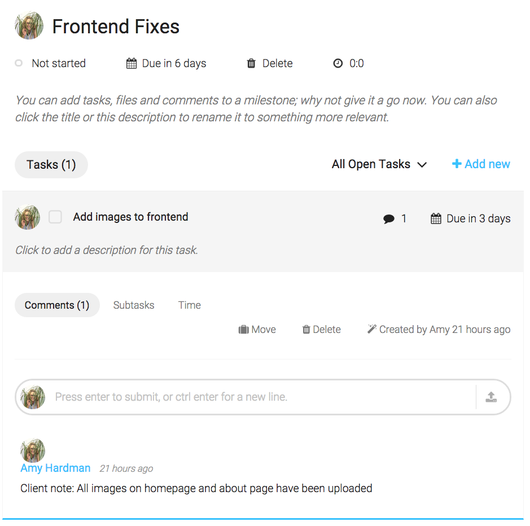 Clients can view the status of their project, adding project notes should they wish to leave feedback. Are you ready to apply a similar process to your business? From my experience, keeping our clients up-to-date and providing them with status information as frequently as possible has resulted in better relationships, less speculation and an improved follow through on feedback (which is also generally nicer). I hope that this insight has helped you to think about some processes that you can put into action to effectively manage your client updates. We’d also love to hear back about your strategy and whether or not it has been a success, so please get in touch or leave a comment.